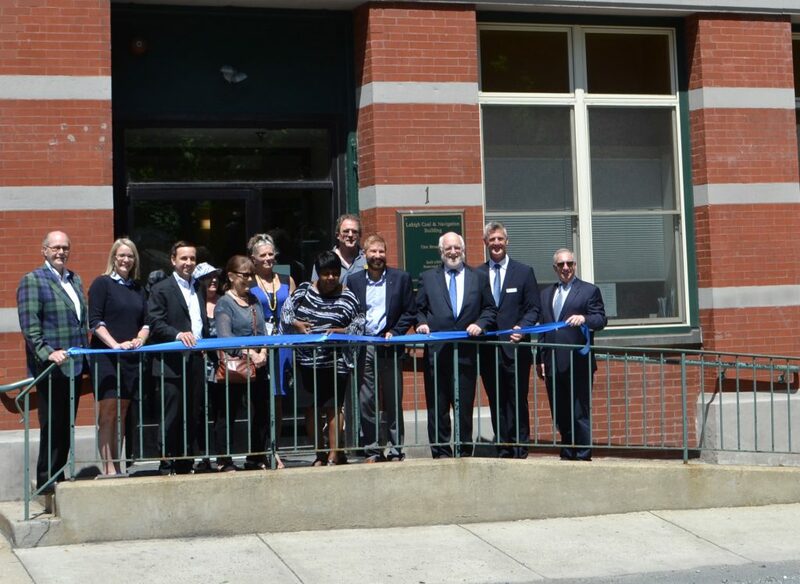 On Thursday, May 24 at 11:00am, the United Neighborhood Community Development Corporation (UNCDC) hosted a grand opening celebration at the Lehigh Coal & Navigation Building at One Broadway in Jim Thorpe. UNCDC, a nonprofit housing and economic development subsidiary of United Neighborhood Centers of Northeastern Pennsylvania and based in Scranton, began developing the property in February of 2017 and wrapped up in December. The building, which provides housing for older adults, was completely refaced and renovated, including the facades of the building and new windows and signage. Residential apartments received newly painted walls, new flooring, and completely renovated kitchens and bathrooms. The community room, elevator, and common areas were also updated. Present at the ribbon cutting and pictured above are, back row (left to right): Maureen Sterner, Jim Thorpe Borough Council; Deb Keiper, building manager; Rob Grimm, Grimm Construction. Front row (left to right): Andrew Hailstone, Kreder Brooks Hailstone LLP; Sharon Byrne, Peoples Security Bank; Chris Tully, RBC Capital Markets; Graysha Harris, GKH Consulting; Sherry Pates, Pennsylvania Housing Finance Agency; Tim Berger, District Office Manager for Rep. Doyle Heffley; Michael Hanley, CEO of United Neighborhood Centers; Fred Duncan, Relationship Manager at FHL Bank; and Mark Cohen, Askot, Weiner & Cohen, LLP.